Our adoption took almost a year to complete. The "paper-chase" occupied several months and then many more months were spent waiting. At times, it appeared that there would never be a baby at the end of the journey - that we would spend the rest of our lives answering the recurrent question of friends and family...when? But once we arrived in Ethiopia, the pace felt uncomfortably quick. We left Atlanta on Friday and arrived in Ethiopia late Saturday. 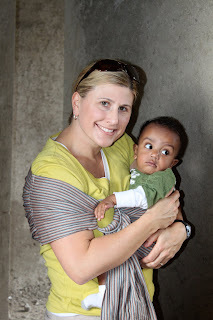 On Sunday morning we met our son and on Monday we signed papers at the Christian World Adoption Ethiopia office. Our paperwork was meticulous and our agency was very organized, so on Tuesday the long-anticipated Embassy appointment felt a bit anti-climatic...which I suppose was a good thing. The Embassy appointment consisted of a long wait followed by a quick review of our paperwork and a few questions about our child's history - and the adoption was final...baby Caleb could leave the country with us. On Wednesday, all of the "official" business was complete and we were finally beginning to feel a bit more adjusted to the time and comfortable with our surroundings. The visit to Acacia Village was a much welcomed chance to see some of Ethiopia. Acacia Village is a multi-purpose facility being built by our adoption agency consisting of multiple buildings (housing, classrooms, a health clinic, lodging, etc.) dedicated to meeting just a few of the needs of orphans in Ethiopia. Below are pictures of that trip.